Braxton Edward (Tony) was born in Memphis, TN, in 1979 while his father was working for a security firm. Tony attended Memphis Public Schools through 6th grade. He then attended Memphis Junior Academy for a year, and was homeschooled through the remainder of high school. By that point, the family (now including sister Jenny) had moved to southern Oregon. While in Memphis, Tony generated quite an interest in playing the French horn, taking private lessons and playing with the River City Community Band (now the River City Concert Band). While in Oregon he continued his French horn playing with the Youth Symphony of Southern Oregon, Southern Oregon University Symphonic Band, Southern Oregon Concert Band, State of Jefferson Community Band, and occasionally sitting in with the Rogue Valley Brass Choir and once with the Ashland City Band. Once he was old enough to start working, he entered the employment of Wendy's but, due to a move, switched to Burger King where he remained for over 3 years. In June 1999 he returned to Wendy's. 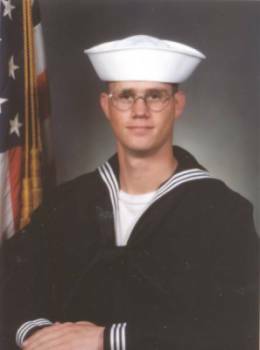 In the spring of 1999 he enlisted in the U.S. Navy and signed up for electronics school with a delayed entry for August. Unfortunately, an accident caused considerable damage to the right side of his face requiring plastic surgery which threatened to delay his entry even further, but the plastic surgeon gave him full clearance and Tony went off to boot camp at Great Lakes, IL, as scheduled. Tony graduated from boot camp on October 8, 1999. He attended two electronics schools at Great Lakes and was transferred to Whidbey Island N.A.S. for a couple of months as an electronics technician. He was then sent for more schooling to Keesler A.F.B. near Biloxi, MS, then transferred back to Whidbey Island where he remained for a couple of years. During his tour at Whidbey Island he was awarded the Navy and Marine Corps Achievement Medal (see certificate). In January 2003 he was transferred to Bahrain where he spent another year. In January 2004 he was assigned to the carrier John C. Stennis based in San Diego, CA. In January 2005 the home port for the Stennis became Bremerton, WA. In January 2007 his tour with the Stennis ended and in March he was shipped over to Sicily (Italy) to begin a two-year tour of duty there. In February of 2009 his tour in Italy ended and Tony chose not to go any further with the Navy. He has returned to the States and is in the southern Washington area (near Seattle) where he is settling down and has started his own business.